The Security module adds password protection to your team sheets, match reports or resources. On receipt of you order we will carry out the work required to setup the Security module. For latest pricing and to order the Security module contact sales@miSOCS.com. 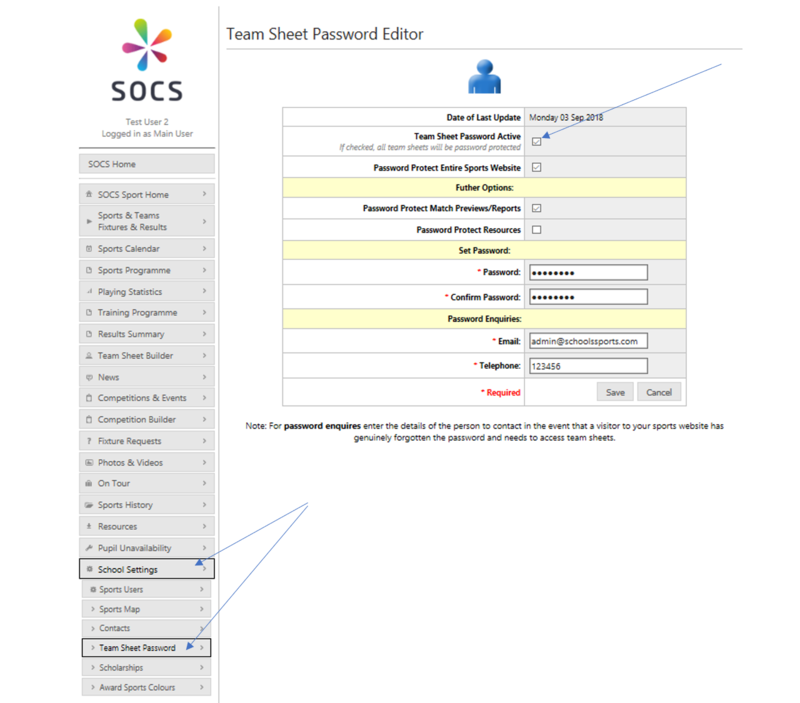 Only a SOCS main account holder can change the contact details for password enquires and the password needed to access team sheets. To edit these see Making Changes below. By default the password will always be activated when the Security module and the Team Sheet Builder module are setup simultaneously. If a school has previously used the Team Sheet Builder module (or if requested), then the Security module will be setup with the password de-activated in order to allow schools sufficient time to inform staff, parents and players before Team Sheets become password protected. Only main account holders can activate or de-activate the password protection provided by the Security module. Password Activated. When activated anyone visiting your sports website and clicking through to any team sheet will be prompted to enter an access password to view the names of the players selected for teams. Password De-Activated. If essential the password can be de-activated by a main account holder at the School. Once de-activated anyone visiting your sports website and clicking through to any team sheet will NOT be prompted to enter an access password to view the names of the players selected for teams. Once the security module is activated the password should be communicated to your players, parents and bona fide followers so they can see team selections. For additional security the password should be changed periodically. Important: Don't forget to notify your players, parents and bona fide followers whenever you change your password. The security module has no impact on Big Screen. Team selections will be visible on Big Screen as usual when team sheets are published. All future and any previously published team sheets (prior to activating the security module) will be password protected. Only the Main Sports User account holder can change the team sheet password. Step 2. Navigate to School Settings > Team Sheet Password in the main menu, indicated by the red arrow in the screen shot below. Step 3. Make any required changes to the password and main contact for password enquiries and then save. Team Sheet password security can be switched on or off. To switch password protection on or off, navigate to the password editor screen and check or un-check the Team Sheet Password Active check box, indicated by the purple arrow in the screen shot above.